How lucky am I? It must be due to my Irish heritage. My first flight in New Zealand just happened to be on one of the best days of the season and caught everyone by surprise. Bryan Moore (local living legend) had been trying to cross the divide north of Cascade Glacier for years but had always encountered a fierce head wind. For some reason there was none this day. 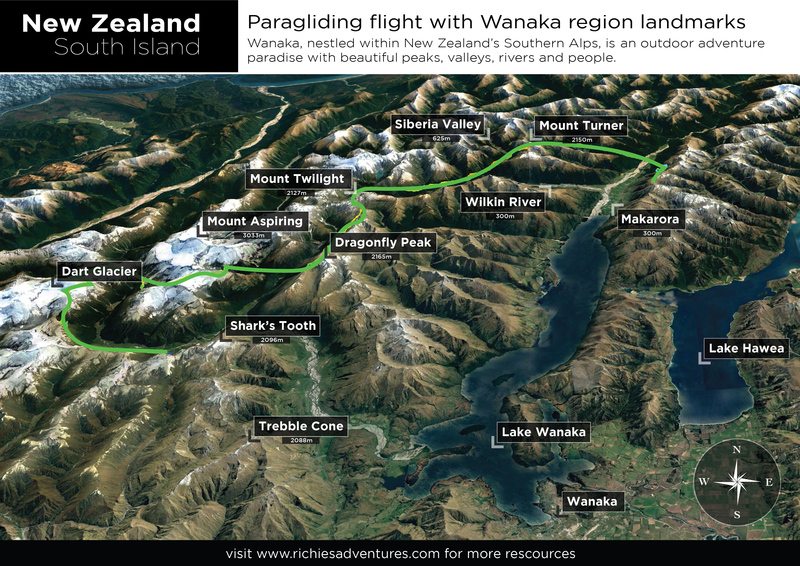 The flight, near the beautiful town of Wanaka, saw Bryan Moore, Krischa Berlinger, Pete Groves, Michal Karnic and I launch from a grassy slope above the Wanaka Mount Aspiring Road into the West Matukituki Valley. With Sharks Tooth Peak (2096m) dominating the landscape to our east, we skirted around Dart Glacier towards Mount Aspiring (3033m) in the north. After dipping our toes over the divide, we headed east over French Ridge Hut, Rob Roy Peak (2644m) and Low Peak (2609m). Tracking to the south of Mount Avalance (2606m), we crossed over Duncans Knob (1676m) and entered the East Matukituki Valley before flying over Dragonfly Peak (2165m) and Whare Kea Chalet. We then tracked north over the Wilkin River towards Mount Turner and finally bore east over the Makarora Valley to land high between Mount Ernest (1878m) and Mount White to camp for the night. Mid flight we were joined by Leo Chelle who flew an impressive line from Glenorchy. Perhaps I landed on a leprechaun, as when we woke the next morning, our flying plans to head into the Mt Cook region were blown away with the north wind… and after retreating to lower ground for a strong crosswind launch, I landed in a still warm, fresh cow poo… not ideal for hitching back to Wanaka. The forecast for the next 5 days meant we wouldn’t get any flying in. Time for some different fun. Lucky there just happens to be bucket loads of it around Wanaka.